Today kicked off Week Two in The Artist’s Way course. It was an amazing first week and I’m loving this twelve week journey, paired with reading Liz Gilbert’s Big Magic. 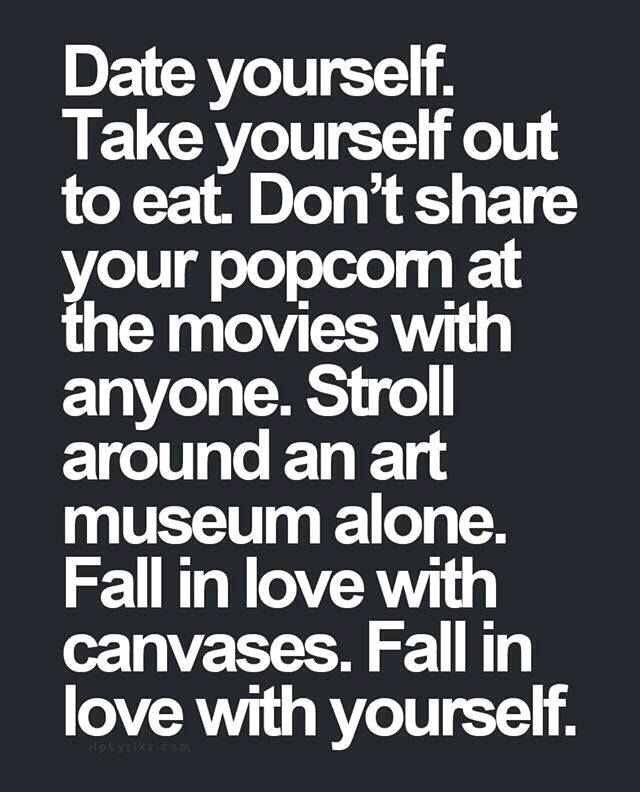 Sunday is my Artist Date day as well, when I take myself and my artistic side out for fun and inspiration. I’ve been looking forward to Sunday afternoon all week, and yesterday, began thinking about what I’d do today. I learned last Sunday, as I prepared for my first artist date, to listen to my inner artist and be guided by the Divine and my intuition. So yesterday, I asked my artistic self, what shall we do tomorrow? What arose was to go searching for my heart. In reality, this year’s representation of my heart. Every Christmas, I purchase a heart ornament for the Christmas tree. This is my thirteenth year to do so. Most of my heart ornaments are silver, representing Mithril, a silver metal from the Lord of the Rings stories that is beautiful, strong, and valuable. Mithril is my soul name. It reminds me that I am more than I appear to be. 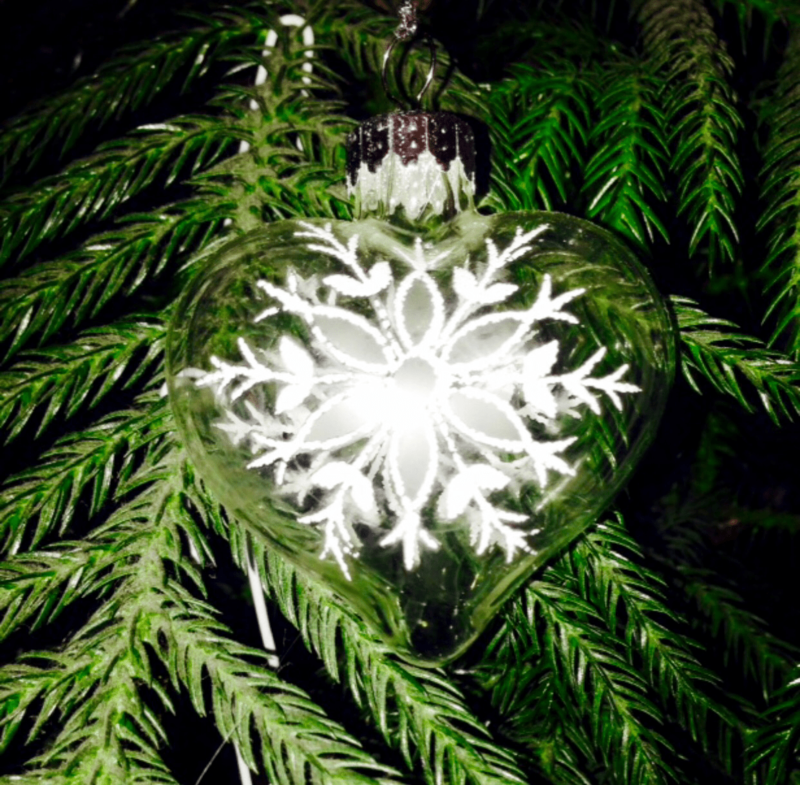 Some of my hearts are clear glass, which represents a heart full of light, as I always hang these ornaments near one of the twinkling white Christmas lights. I haven’t yet found a heart ornament this year. I checked my usual sources…Hobby Lobby and Cracker Barrel. There was nothing suitable at either store. So the nudge to go looking today was a welcome one, and I was exited to check out a few stores, confident the right ornament would be found. This week, my inner artist was trekking just ahead of the upcoming chapter, when the suggestion was given to search today for my “heart”. Those ornaments represent the deepest, truest essence of who I am, and who I am continuing to become. It is so easy for identity to become enmeshed with what we do, rather than who we are. I am a mom, grandmother, sister, daughter, realtor, writer, gardener, woman, reader. Those titles all relate to what I do, and I love doing all those things. And I am more than all those titles. They are part of the whole, not the whole. About 13 years ago, I began the process of drawing all the fragmented pieces of my heart, all the bits of who I was, together into a whole. As I reclaimed pieces of my heart that I had given away, or locked away, I envisioned my heart knitted back together, strong, healthy, whole and full of light. I asked God to show me who I was. The name Mithril was given to me, through a series of repetitions and synchronicities. And the tradition of buying a heart ornament, yearly, was born. As I drove away from the house this afternoon, on my date, I asked where I should go, in search of my heart. I was thinking of starting at the Hallmark Store. Surely a good place to find a heart ornament! But I strongly felt Michael’s, the craft store, was to be my destination. I loved wandering through Michael’s. The store has Christmas items prominently displayed. I wasn’t the only shopper out on this gorgeous day and the store was full, with a festive atmosphere. I walked through the whole store, enjoying the creative feelings that were stirring, and cheerful conversations with strangers, without finding a heart ornament. As I walked toward the front, down the last aisle, I spied an end cap display of boxed ornaments. Each set had four small glass ornaments nestled within. And there I found my heart. There were sets with gold hearts, and red and silver hearts. I had a box in my hand that contained a silver heart, thinking that would work, when I saw the box with four colorful hearts in it. My typical silver or clear heart ornament was not there, but I felt so drawn to those beautiful little hearts. It came to me then. I would tie the four hearts together with a silver cord or ribbon and hang them that way, as a cluster. The four hearts represent all of me…my spiritual side, the artist within, the relational me and my business side…all combined into one! And the colors are perfect for one who has rediscovered the joys of coloring this year. Those hearts are perfect. My artist within was pretty pleased with herself. I’m loving this journey. And I’m excited to see what the rest of the week brings. 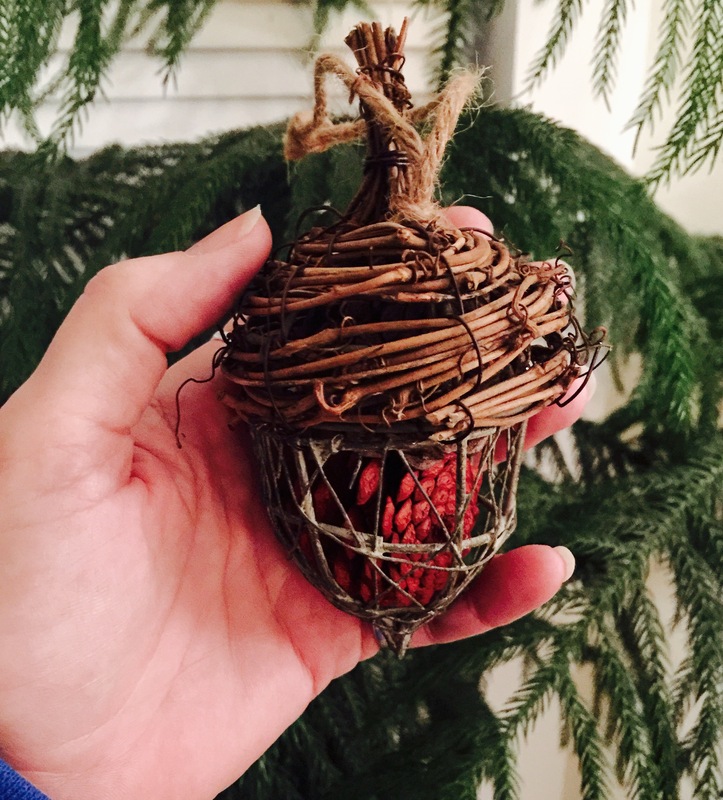 I picked up an acorn ornament as well. The acorn has been my secondary symbol for the year, to remind me of my journey, the good times and the challenging ones, the people who have travelled alongside, and those who passed.